Everyone has a story, everyone has a father, everyone had some good, some not so good experiences from a father or being a father. In a world that is being devoid of true examples of fatherhood, or might even debate on what it means to be father, I would like to share a story that might lend some perspective. Coming from a culture that has so many festivals, occasions to celebrate in India to a point I remember growing up we had as many as over 30 days designated as holidays in a calendar year. Holidays to celebrate big occasions and religious importance and some seemingly mundane things. As a kid we always loved the religious holidays because my mom always bought new clothes for us and that was the only occasion that she could think of buying anything and as difficult as it was she did it. I always looked forward eagerly to it. So when I heard about a designated “Father’s Day”, though initially my reaction was “really why?” It seemed like one more way for the commercial world to capitalize on it. Honestly to me a “Mother’s day” seemed more justified than a Father’s day. For some of you readers who are familiar with my story my mother was the principal figure in my life growing up. Let me indulge. Fathers come in different packages for each relationship. Some of you had a great dad that you can reminisce on, some may have a great dad that is in your life as you read this, some of you might have dad “well he is there”. Some you had an absentee father, some of you had an abusive father and yet some of you never had a sense of what a father is like and the list can go on. You see, in my case my father died on of a heart attack at the age of 48 when I was 12 years old. Prior to that I had an experience of a Dad, who was always on the move and gone, very angry even though he married my mom out of “love” ( for all my American friends as you wonder, I didn’t know there was any other way, need to take a peek in the bible. Arranged marriages were the predominant way back in the day and we Indians, the curry kind, just stuck to it.) bucking the tradition of arranged marriages, resembled one of traditions and not love, once the knot was tied. He was hard working, very entrepreneurial. Me and my brothers are 6 years apart and it was clear I was the favorite child (I was the youngest) and he had no inhibitions showing it. To a point my brothers bore the brunt of the bad side of who he was. From the outside though it looked I was being loved, it started building a character base in me that had some major implications growing up and later in life. As life went on, though I didn’t see much of him, when I do see him I only saw the angry side and his lack of “whatever” in his life whether he could or could not provide well for us or his addictions. My mom paid a dear price of loving a person so unconditionally who abused her very badly. I remember as young child coming in between to protect my mom from his physical abuse. See, he loved me but in way I never felt it. When I came in between, the abuse stopped because I know he didn’t want to beat me up. Yet he was beating me up. This partiality towards me did more damage than not. Later in life with the multitude of stress in his life and my smart alec syndrome, I did become the target of his anger. Let alone mental scars I have physical scars to prove it. With this as background and when he suddenly passed away mom became the central figure of this family. It does not matter what the reasons why a child does not have dad, it begs to point out that the impact of father in a child’s life, or lack thereof shapes the man or woman he oe she is going to become. I paid a dear price a for a long time in my life and worse yet people around me paid a dear price of a man who was wrapped up in a concept of dad or who a man should be like. This seems all too convenient to blame a childhood that was manifesting itself into the adulthood. True, but one does not have to be stuck in that. It is as simple as a decision to be different. But yet again there is an issue with being different. Most of us in our eagerness to be different, define our lives by modeling what we don’t want to be based on the experiences of life rather than actually taking the time to define what they want to be. I know what I don’t want, but do I really know what I want? If I’m allowing what I don’t want to define me, then the consequences of what I do can be as disastrous of the very things I am running from. My father failed me. Maybe your father failed you, or maybe your father was great, but I can guarantee you he failed you in some way. That is just the way it is. You say, what do you mean? It’s this word called SIN. Our culture over the years slowly but surely removed this word from our vocabulary. Yet not until one understands this very word SIN, one will never be able to reconcile with our past. I tried to meditate, tried to transform transcendentally, tried to become one with the universe, tried to get close with ‘the god within’ and ‘the god without’ and all that search just left me empty. I did not like this word SIN. I have to realize the fact that I am a wonderful creation that God made in His own image. Genesis 1:27. Nothing around me is an uncreated thing. The laptop I am using, the Starwars theme I hear on my son’s X-box game, the chair I am sitting in and the beautiful front yard that I overlook, everything was created. He created you for one and one reason alone and that is to have fellowship with Him. 1 Cor 1:9. Genesis3:8 says He walked with Adam and Eve in the garden. Something happened to this fellowship. Read Genesis 3. SIN entered and SIN separated us from God. SIN is more powerful than I am as human being. God has set up order and rules also to protect His most prized creation without violating the free will He gave him. The only way to reconcile SIN is through a blood sacrifice. You might say why? In order for God to be good because He is the only one who is truly good bible, says He has to be not only merciful but He has to be just. But the blood sacrifice cannot be marred with SIN for it to qualify as a sacrifice. Here is where John 3:16 has so much relevance. We have heard this verse so much that many a times it lost its incredible relevance to what is happening here. God is the only one who can reconcile. He had to send His Son to be that sacrifice. Jesus had to be that sacrifice. See until I saw my dad through this lens or revelation I kept him in my captivity. The captivity is not as much as my father but my own captivity to my SIN. I had to be released. When I am released then I have the capacity to see my father through that lens and everything changes. You see, Jesus would have done everything He has done on the cross and resurrection even if I was the only person in this world. He loves me [and you] so much that He paid the ultimate price to reconcile me back with my Father to once again have that fellowship with Him and walk with me and you in the garden. That is where I understand the true love of the Father. My earthly father is not capable of it. One of my friends a few years ago blessed my then 18yr old son(he is 22 now) with a fishing trip of a lifetime. 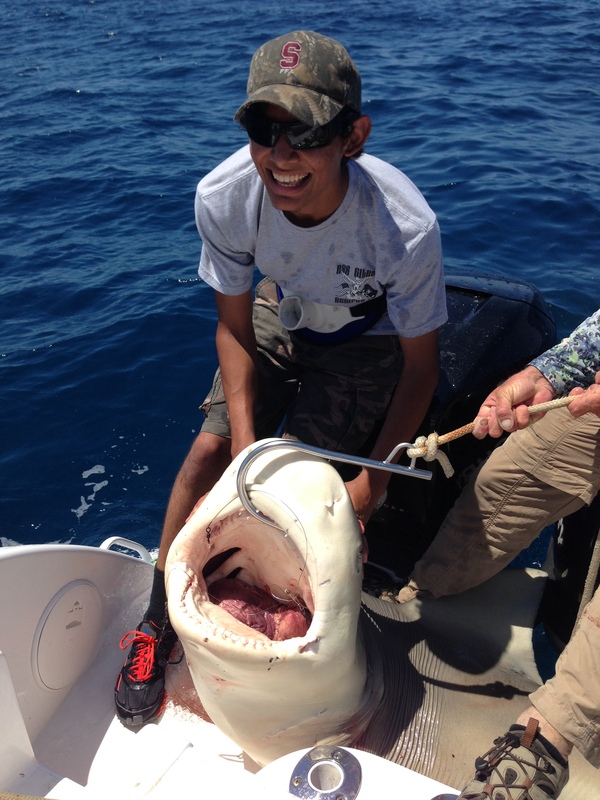 I was humbled to see how he treated my son to create an amazing memory that my son will share with his grandchildren of the first shark he caught. You might say “that’s nice” and it is. You see, my friend grew up with a quite a messed up paradigm of father in his life. The reconciliation he received via the finished work on the cross transformed him and allowed him to be one of the best dads to his children that many men can model. Yet he will be the first one to admit he is a sinner saved by grace. There are men in this world that have taken the price of the cross seriously. My friend happens to be one of the men I know that have made a covenant with each other that they will model the best fatherhood they can because of the price Jesus paid on the cross to allow us to have that fellowship with our heavenly Father. It does not take a village, it does not take a community, it does not take role models. It takes but real men who are surrendered to Christ to model a fatherhood that can create a virtuous cycle of legacy instead of vicious cycle this world is so desperately stuck in. Will you, my reader, make a decision to embrace the message of the cross and start the virtuous cycle. We need you to. Your sons and daughters need you to. I’ve written and spoken on this topic before, but it begs repeating and even expanding in the wake of such an unusual election and the state of shock our country finds itself in now. You’ve heard the adage: It’s not what happens to you it’s how you respond that counts, right? So true! That is such good advice. It is the story we tell about the events of our lives that shape our lives more than the events themselves. The story we tell ourselves will either empower us or dis-empower us and we must work that out or we will get stuck by our own thinking. Having mentors in your life who can point out the world beyond the forest and the trees when we can no longer see the forest for the trees is an essential component of every successful person’s strategy for living. Lazarus, Tendulkar, Jesus and the question is? This morning as I was going through my daily study of the word, I was in John 11. John 11:33 – He groaned in the spirit and was troubled. Why would a man/God who is all-powerful, all-knowing groan in the spirit, be troubled and weep? You only weep when you are hurt in the soul and cry when you are in pain. What was so special about Lazarus? Why Lazarus? The Bible does not tell much about him, yet by the way Mary and Martha respond to his death, and many of the Jews, it does seem like Lazarus was very dear and seemed to have had a great impact on the people around him. And based on the reaction from Jesus, it does seem Jesus had some personal affection towards him. These are good questions from a mere human point of view. Allow me to try and get into Jesus’ head and maybe see from his point of view. Mind you I am trying to comprehend the sovereign God’s mind. It seems blasphemous to even consider it, because I will never understand it. Yet, from what is said about Jesus and what we see through the eyes and the words of the Bible, there is much to be inferred. Jesus, the Son of God was about his Father’s business. All he did was talk about his Father. There was nothing that brought him more joy, but conveying and carrying out His Father’s mission on earth, in particular redeeming God’s most coveted creation, man, back to Himself. The only time Jesus grieved ‘of the Spirit’ throughout the Bible is when He feared the loss of connection with his Father. It was excruciating. It is unfathomable by a mere sinner like me. That broken connection with His Father was a very lonely and scary place for Him. Yet, that is the place He had to go to [take on] experience the condition of a sinful man to comprehend [propitiate] the impact of sin and its separation from the one triune God. In the case of Lazarus, to do what he was about to do, he had to come face-to-face with death. Which meant to be in a place of sin, which caused death, which means it would break his communion with his Father. Lazarus was dead and in order to bring him back to life, He had to go to a place that He is fearful (fear of God). To go, the price is that he will have to let go His connection with His Father. Yet, he loved the sinner Lazarus immensely, the mission was clear, that not one should perish(Matthew 18:14). Perhaps He knew Lazarus was not a redeemed soul and so He needed to give him a second chance(John 5:28)? Whatever the reasons were, Jesus needed to go into a place of death, a place of sin, with the direct cost of Him losing his connection with His Father. The same was when he sweated blood in the Garden of Gethsemane and eventually on the cross, the excruciating pain he suffered, not physical, but the separation from His father; a very lonely, terrifying place. The lengths He went to be obedient to his Father, and stay on a mission that His Father entrusted in Him, for me, as a mere human being and a sinner, I will never be able to fathom. Yet from that dark place, he brings forth Lazarus to life. Such is the love of God poured through his son, Jesus, to a sinner like Lazarus. Yesterday I witnessed a retirement and a farewell of a sporting icon of magnanimous proportions of a cricketer by the name of Sachin Tendulkar. I am a big fan of his from a cricketing sense, and though he holds every record one can imagine, and I do have a great appreciation of what a wonderful human being he is. He is a man of good works who has had an amazing career of 24 years in a sport that the best did not last for half that time, and that too without any scandals or any major injuries. His influence over a billion people and many around the world is quite amazing. He is revered as ‘god’ in India and by many around the world. His farewell speech was everything that moved me, made me tearful and proud of a fellow Indian. It made my admiration of him even more real. He showed tremendous reverence of parents, friends, coaches, family, community and an amazing sense of humility that he was able to portray throughout his life as well as a deep thankfulness to god (an unknown god). Every Athlete across sports and countries can learn from his example. It made me feel proud as an Indian-born American. Yet my mind brought a thought to me: Does he know Jesus and the finished work of the cross? With the possibility of fellow Tendulkar fans out there putting a bullet in my head, I say this: As great as he was, as the best possible human being that he is, and I admire all of that, does he know if he is going to hell or heaven?. The Bible says the only way to heaven is through His son Jesus (John 14:6). It is the same question and conclusion I had to come with my mother (See my hinduism to Christ article). It grieves me to write, as I admire and love both of them, though I know my mother more intimately. I do not know the answer in both of these scenarios, but I am convinced every one of us has to face these questions: Who is Jesus? Is He the son of God? Is He God? Is He the only way to heaven? It doesn’t matter what we accomplish in our life, how great we become in the world’s eyes, these questions are more important than the accomplishments that we have in this world. It doesn’t matter what we debate amongst ourselves around these questions, because in the end it better be the right answer to God, and it is between the individual and God. In His infinite mercy He has revealed these answers in the word of God, called the Bible, and has shown His love and inclination to restore us with what he did with Lazarus, and ultimately on the cross. We too have lost this connection with God and are incapable of restoring it with our good works. Sin was the cause of this and hell was created for Satan and his cohorts. With un-reconciled sin we cannot have communion with God. The wages of sin is death. Jesus died on the cross on our behalf and conquered death to restore the connection back with God. Will you, my reader ask these questions: What if the Bible is right and the world is wrong? It could mean the difference between seeing the face of God or thrust into hell which should be no place for God’s most coveted creation. John 3:16. Recently one my cousins who is a few months older to me and one of my best friends growing up asked me a few questions that led me to write this letter to him. He is a very accomplished individual and had interesting journey of his own like I have. He was born in a family that served the communist party of India(his dad is still active) which led him to Russia as a young boy and he learnt Russian and went through his engineering and then successfully worked in Moscow. After the fall of communism he became a successful business man and currently lives in Dubai with his wife and two beautiful children conducting business in Russia and India. I love him dearly and he always was a great example for me growing up. So read on.. Thank you so much for giving me an opportunity to share my faith with you. Having embraced multiple religions and practices since I was a child, as undoubtedly you are aware, I never felt the lack of God in my life. It was only until I found myself asking questions at various points in my life like ‘Who is God?’ ‘Who is God to me’? and ‘Is this God I am serving the one true God’? made me look for answers. It might be of benefit at this point to understand how I came to what is often called ‘the saving knowledge of Christ’. This is important as I grew up in a god- fearing home since I was a baby and have followed many paths which included Catholicism at School, Hinduism and idol worship at home. At my mother’s insistence, and by her example, this included the reading of the Gita on a regular basis, worshipping the god Venkateswara. You may remember, all of us brothers have that in our name. I followed various ashrams and movements, which included, Aurobindo Ashram, Shirdi Sai Baba, Vivekananda, transcendental meditation movements just to name a few. And all this by the time I was 20 years of age! I also made the trips to Aurobindo ashram, Shirdi Sai baba many times on my own as a kid. When I came to the U.S. Christianity was the last thing on my mind. Since I went to private Catholic school all my life, with prayers and assembly every morning before school, close relationships with the brothers and sisters, I honestly thought I understood what Christianity was. I was heavily involved in temple and ashram activities after I came to U.S. until the defining time in my life when mom passed away quite unexpectedly. You see, mom was about to come to the States and live with me. She was my rock. I shook an angry fist at God and went into rebellion for a period of 18-24 months. I even kicked out some missionaries who came to my door at Grad school. The irony of all this, and hindsight is that, God was preparing me to know His Son all this while. 1) Knowing Christ is a heart change and not a head change. The head change comes later as the renewal of mind. For some people it is immediate and others it takes time. The transforming power of Christ in someone’s life comes through the study of His word and what is called the ‘walk’. 3) Adam and Eve are the two first humans on earth. God created man in His own image. The approximate existence of the world is about 6000 years. This is contrary to the misleading and often misrepresented findings of Evolution theories. (Genesis 1:26) Lee Strobel’s book is a great, in depth reference to this. 9) Since the ‘fall’, everyone is born with a sin nature and hence needs a savior. 10) No amount of good works we do can get us close to God as man’s ‘good’ is not pure and God is pure and holy. 11) Religion is man’s quest for God, Christianity(as described here, as Christian is a very loosely used word) is God’s quest for man. 12) Bible is inerrant word of God (authenticity of translation has been proven by manuscript evidence more than any other piece of literature in human history). 13) Christianity is having a personal relationship with Jesus and there needs to be no other mediator between man and God. Priests, pastors and denominations are man-made and caused confusion on this simple truth. Though pastors, elders all have their place in the church and community and mentorship is key to growing spiritually and is modeled consistently through the old and new testament. 14) Any worship that glorifies anything other than the God of the Bible is considered idolatry according to Bible, as seen in the first and second commandments listed in book of Exodus. 16) Jesus is the Messiah Israel is waiting for manifested in the flesh in His first coming, fulfilling over 300 messianic prophecies. He will come again to judge the dead and the living and establish His kingdom in righteousness and in so doing will fulfill the remaining prophecies. 17) There are 66 books in the Bible. Forty men shared in the writing of the Bible over a span of about 1,600 years from the time of Moses to the last book written by John. The last book of the Old Testament, Malachi, was written about 443 B.C. The first book of the New Testament, Matthew, was written about 40 A.D. leaving approximately a 500 year gap between the Old and New Testament books. Yet through manuscript evidence and many other archeological evidences, an amazing continuity is firmly established. Evidence has been produced throughout the history of mankind on the authenticity of the Bible. As recent as 1947-1956 findings of Dead Sea Scrolls which included pieces of each of the books of the Old Testament, except for the book of Esther. There are also numerous extra-biblical writings throughout time that authenticate the translations and understanding of the Bible. A useful antidote I have heard is the Old Testament is Jesus concealed and the New Testament is Jesus revealed. The above represents truths I have come to know and understand through study. God got hold of my heart in 1993 and revealed His Son Jesus Christ to me. The following thoughts share more of my personal reflections, the softer side of my ‘walk’ with God since then. One of the hardest concepts for me to understand and cope with after I became a Christian was this concept of ‘being born a sinner’. Mind you, not only sin was a hard concept for me to grasp let alone being born with it. I only inherit the physical DNA of my parents, but the sinful nature I have inherited from Adam, the first human. That is why no one had to teach me how to be angry at my siblings or jealous of the toy someone else has or disagree and have temper tantrums on my parents. I was born with it. It’s a small proof of the inherent sin I had in me. When Eve (second human God created to be companion for man) first sinned in the garden when Satan tempted her into saying that she can be equal to God, she fell for it and Adam’s sin of omission by not protecting his wife from evil started the cycle of sin. Until then, in the book of Genesis God tells that man was created in His own image without sin and had perfect communion with his Father. The sin in the garden broke that perfect communion and separated us from God and the restoration process has since then begun as God is holy and perfect and does not co-exist with sin. The other account of Genesis is that the profound difference between all other life forms God created and man is the free will to choose and the conscience to know right from wrong. The price to pay for restoration of this relationship back to where it was, is that someone had to die (the wages of sin is death) and conquer the death (that is why Christ rose on the 3rd day) and whoever believes in this truth has had their debt of sin paid in full (past, present and future sins). This is what restores communion with God. It has nothing to do with the good works I do in this world or what I grew up with the concept called karma. My good works, if anything, are a reflection of the gratitude for what He has done for me, and reflect the depth of my obedience to Him to be His servant in this world. Nothing I can do earns me communion with the One True God. 1) Where is my mom? In heaven or hell? This was a big battle initially for me as I refused to believe she was in hell because of the wonderful sacrificial life she had to live and the good she has done for me and everyone. I came to understand that as wonderful as she was, she was a sinner just like everyone else, in need of a savior. Nevertheless, I had many sleepless nights and as I continued to get stronger in my relationship with God through the study of the Bible and mentors who allowed me to think and pray on this, eventually a great peace came around me. I still don’t have the right answer. The study of Gospel of John and Revelations helped me have peace with this. Secondly, I am not sure if my mom ever had been given a chance to hear the gospel of Jesus explained to her to reveal her Son, but that is not the point. Though as a Christian, I am to spread the good news of the Gospel, it is not me who decides who gets to know Him and at what time. That is between God and them. My relationship with Him is personal and I am the only one to answer when God does give me a chance to answer the question ‘Do you believe I sent my Son to die for your sins so you can have the lost connection restored and have everlasting life with Me?.” How I am able to answer that central question will decide everything for me. It is none of my business how someone else answers it. I am comforted that by Jesus’ own words he states in Matthew 18:14 “In the same way, it is not my heavenly Father’s will that even one of these little ones should perish”. I am to intercede in prayer on their behalf but I cannot worry about the outcome. Worrying is a state of fear and opposes faith, so worrying is really sin as stated in the Bible. I am to bring up my children in the way of the Lord as the Bible commands, but somewhere along the line they have to ‘own’ their faith by accepting Christ into their hearts when He reveals himself to them. So how do I love my family who do not know Christ in a saving way? In just the same way Christ loved the people around Him when he walked on earth. There were believers and non-believers. There were even believers that after believing ran away from Him and everything in between. He came to do the work of His Father and obedience to His Father was more important than anything else. My love for my family became so much more unconditional once I gave my life to Christ that I get to see them through His eyes today which removes all judgment, and I can see them as God sees them. So where is my mom you ask? I don’t know. I do know this much: God used her in my life to be where I am today. I am ever so thankful and I pray she is with Him. If she is with Him then I know that Jesus saved her and she accepted Jesus as her savior. I know that if I reject the gospel I am going to hell. Beyond that I am not to speculate, but be thankful for the incredible things she taught me, which God used to reveal Himself to me. I have special love and appreciation for her role in my life because I understand this truth now. It is God’s will that ‘none should perish’ (Matthew 18:14) and He wants everyone to be saved, because He is ‘merciful’ and’ just’. Merciful by sending His son Jesus to do for us what we could not do for ourselves, namely die as a sinless man in our place. He is ‘just’ because He does not violate His own law which in it He created us in His own image and gave us free will to choose. So He will give us a chance to choose (Ephesians 2:8.9). So before I leave this earth, myself and everyone has to answer one question. ‘Who is Jesus to me and am I going to heaven?’ The answer I give better line up with the truth. 2) What about other religions? As you know, I used to embrace a polytheistic (many gods) approach to spirituality, but after this revelation I really believe there are two distinct camps that all religions fall into. One is a man-made, works-driven approach in a never-ending quest to find God and experience enlightenment. The true heart of a Christian (which has nothing to do with denominations, beliefs, priests etc. though they all have a place) is God’s quest for man for the purpose of redeeming him back to Himself, which man is incapable of doing for himself. I’ve heard it quipped this way; I had a debt I could not pay and Jesus paid a debt he did not owe. Realizing no matter how hard I work at it, I cannot close the distance between myself and God, but God has predetermined to redeem me! And He will use any means to reach me. 3) Am I better than other people because I know Jesus? Absolutely not, if anything, this revelation should produce more humility, compassion and gentleness for other people in my heart as I truly understand my state of being separate from God. I am more sensitive to sin than I have ever been as Satan even more hates me because I got it right with God and I am better target for him to chase. It is in the end a losing battle for him, as the finished work on the cross took care of that. Satan will be completely annihilated through the second coming. Having said all this, I claim to be no expert in the Bible, nor I will claim to understand everything, all I know is that I am fortunate to know for sure that I am going to see my Father in heaven when I leave this earth because of the finished work of the cross. So, is Jesus a prophet or Son of God or both? The answers are very clear in the Bible. I pray that this will in part raise your curiosity further and that you will delve deeper into mystery of grace as presented in the truths of the Bible. You have everything to gain. If this is only making you ask more questions and maybe even a little confused, you are right on track. As we wrap up 2011 and expectantly enter 2012, it’s an interesting question to ask, what’s the score? Given the holidays and all the multitudes of scores we try to keep up with, being sports fanatics, how many of us are asking ‘What’s the score?’ in our personal lives? The scoreboard in my life has been both a friend and foe to me. Friend when it looked good, and foe when it did not, or so I thought. Yet the scoreboard is neutral. It’s a truth-table of events, relationships and tasks. I am a sinful man, saved only by the grace of God by the finished work on the Cross. The bible says in Matthew 7: ‘You will know them by their fruits. Do men gather grapes from thornbushes or figs from thistles? Even so, every good tree bears good fruit, but a bad tree bears bad fruit. A good tree cannot bear bad fruit, nor can a bad tree bear good fruit. Every tree that does not bear good fruit is cut down and thrown into the fire. Therefore by their fruits you will know them.’ So how is scoreboard and fruit connected. As I scan through different events in my life I have noticed one pattern, I hardly paid attention to the scoreboard. Or worse, I wasn’t even keeping score and yet wondered why I wasn’t happy with the fruit I was producing. I’ll give you a couple of examples: Growing up in India, education and school were such integral part of our upbringing. If you have Indian friends, it is assumed that people like us are good in math and science, or at least 9 out of 10 of them. You guessed it, I was that 1 out of 10. It takes courage to pay attention to the scoreboard when you know either you are falling short or worse yet, you are going into the game knowing that you are not good enough. Things like self image and inherent sin in our lives have a lot to do with how we look at the scoreboard. It is so important to have the right kind of encouragement around you during these times. Needless to say, the many lessons that I would have learned from the Plan, Do , Check and Adjust process, had I known then. It is not about right or wrong but about having the guts to face the reality of the scoreboard. Which can only be done if you are focused on the end goal (fruit), seeking the right mentorship and making the right adjustments. I did finish college with a Bachelors and Masters, but out of brute force of will only to realize that I had missed so many crucial lessons in the process. Don’t get me wrong, I am thankful for God’s grace in accomplishing the same. Later in my corporate and business life I realized that whether I was paying attention to the scoreboard or not I was a part of a scoreboard someone was paying attention to. The ’employee-ism’ over the years has forced people (or allowed) to delegate the scoreboard to someone else. This is sad, but true. For the first few years I was like this. Later, as I helped start companies, helping them go public, losing to bankruptcies, I learned a lot about keeping score. I also noticed how we as a society have learned to manipulate and make scoreboards to our liking. But make no mistake, the scoreboard in it of itself is not the final score. The fruit we bear is. May I cite the Enrons of the world, the entitlement programs, the banking system, so on and so forth. It’s almost like we legislate the behavior to manipulate it and call it ‘legal’ and in the process abandon the truth. The ‘winning at any cost’, ‘winning is the only thing’, ‘if you don’t win you are loser’ or it’s cousin, victim thinking (even church-going Christians subscribe to this) has brought to bear the central issue that needs to be addressed called CHARACTER. The scoreboard of life is the single biggest measurement of the character we have up until that point and the character development we are going to undertake or abandon by the PDCA process. My friend Tim Marks is a master of utilizing the scoreboard to propel him forward in his life. So how do we make our scoreboard propel us to be the best God wants us to be? 1) Have a dream big enough that it scares you to become the person you need to become and without God’s help it will not come true. 2) Enter into a field or environment where keeping score and PDCA process is the cultural norm. 3) Keep a personal scoreboard. 4) Be accountable to someone who also is chasing a scoreboard and seek mentorship. Make the adjustments whether it is in character, strategy or relationships. Remember nothing is fatal, only not paying attention to the scoreboard is. 5) Utilize the PDCA process to it fullest. 6) Give all glory to God. What I love about you is that you are a hungry enough student to read this. The scoreboard, the wins, the losses, the joys, the heartaches, 2011, 2012, you and me, all of it is a love affair with life.